Amazon.com Price: $234.22 (as of 24/04/2019 21:06 PST- Details)	& FREE Shipping. The Health Gear ITM 5500 is a very stylish inversion table designed in a racing seat style. One of the main highlights of the Health Gear ITM 5500 has to be the comfortable 3 inch padded foam backrest, in addition to the optional heat and vibration pad. The ITM 5500 is able to hold anyone up to 300 lbs in weight and is suitable for users ranging from 5 ft 1″ in height to 6 ft 5″. If you are under 5 ft 1″ and require a similar inversion table we suggest taking a look at the Merax inversion table here that is able to hold anyone between 4 ft 10 and above. The Merax table is also available at a very similar price and is very well rated. 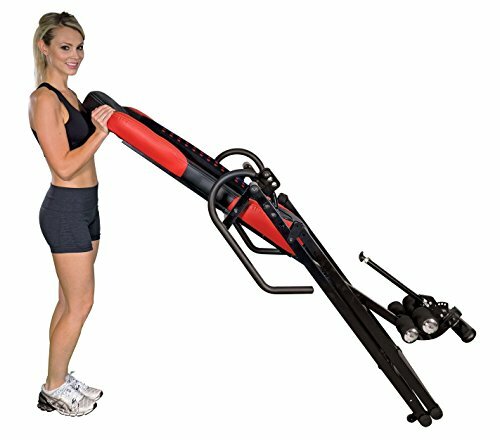 The Health Gear ITM 5500 does away with the tether strap incline angle system found on many other inversion tables and opts for a more convenient side pin. Unlike the tether strap variations this means you do not have to leave the table in order to adjust the incline angle. The pin system can be used to limit the angle of inversion to 20, 40 or 60 degrees and you also have the option of full inversion. As you can see in the image above, on the 90 degree angle image the table is unable to go back any further due to the horizontal bar on the back legs. Therefore, if you do like to dangle from your ankles without being in contact with the backboard when inverted, this inversion table may not be ideal for you. On the other hand if you prefer to be supported when inverted it is probably a good choice. The removable heat and vibration massage pad is also a very nice feature to add. Also the fact that the pad is removable means you can use it on other pieces of indoor furniture such as on a recliner or a bed should you desire. The heat and vibro massage functions can be controlled using the hand controller so you can adjust them as you invert, or once inverted. The heat and massage pad offers 3 massage functions and you can control and adjust the heat, time and intensity to suit your preference. 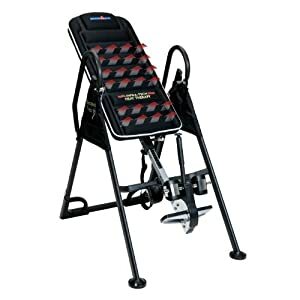 As is often found with inversion tables for this price range, there are often complaints that the heat and massage functions are fairly feeble. However this is often down to individual preference and it is probably wise to consider these functions, more as added bonuses rather than deal breakers. 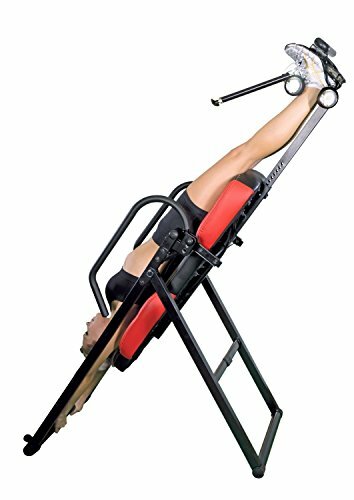 With regards to the other features on offer, the Health Gear ITM 5500 Inversion Table has some great additions. In particular the inclusion of the easy to reach ankle lock lever. The long supportive arms are also a nice feature as are the dual foam padded ankle supports. 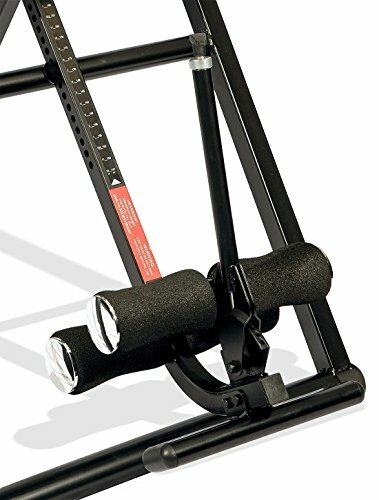 The frame of the inversion table is constructed of heavy gauge steel tube and is powder coated to prevent scratching and damage. The raised curve on the floor support of the frame is also a nice touch, allowing for further stretching. Overall this is an easy to assemble inversion table that has a number of positive reviews behind it. The main complaint with this particular table appears to be due to the heat and massage function not being overly strong, however this is often the complaint with tables of this sort. This hopefully should not put you off however, as the positives of this Health Gear inversion table far outweigh any negative comments from a small minority. Amazon.com Price: $338.19 $289.00 (as of 24/04/2019 21:04 PST- Details)	& FREE Shipping.